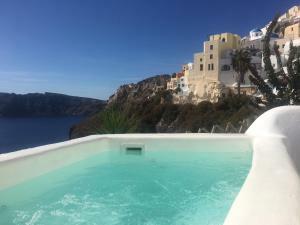 Liakada Oia Suites offers typical Cycladic-style accommodation with whitewashed walls and minimalist décor in the picturesque village of Oia. 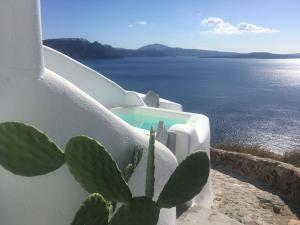 Only children under 3 and over 12 can stay in Liakada Oia Suites. This cave-style suite is decorated in a minimalist style with whitewashed walls and an outdoor hot tub. It also has a seating area with a flat-screen TV and CD / DVD player, and a well-equipped kitchenette. dining table and balcony overlooking the Aegean Sea. The private bathroom includes slippers, bathrobes, a hairdryer and free toiletries. Free Wi-Fi and a Nespresso coffee machine are also available. This cave-style suite is decorated in a minimalist style with whitewashed walls. 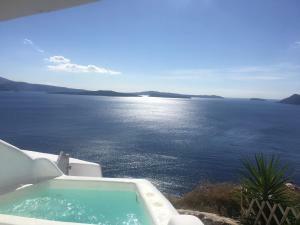 It also has a living room with a built-in sofa, a flat-screen TV and a CD / DVD player, a well-equipped kitchenette with a dining table and a balcony overlooking the Aegean Sea. The private bathroom includes slippers, bathrobes, a hairdryer and free toiletries. Free Wi-Fi and a Nespresso coffee machine are also available. This cave-style suite features a private pool and a spacious balcony with whitewashed walls and minimalist décor. 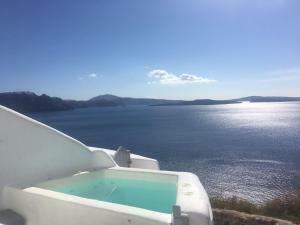 Overlooking the Aegean Sea and the caldera, the balcony offers a seating area with satellite TV and a CD / DVD player, a well-equipped kitchenette and a dining table. The en suite bathroom is equipped with free luxury toiletries, slippers, a hairdryer and bathrobes. There is free WiFi.